Overbite and grinding teeth are as a result of a large temporomandibular muscle. 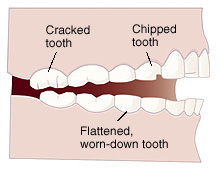 This condition is self-perpetuating as it only gets progressively worse over time as the muscle gets larger and larger the more the overbite occurs. Left unattended these patients end up with a number of problems such as severe headaches TMJ (Lower Jaw) Arthritis and tooth loss. A couple of painless Botox injections is all it takes to solve this menacing problem. 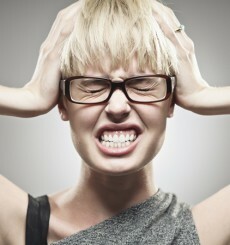 Chronic teeth grinding can cause headache, earaches, facial pain, and even migraines. Dental problems from bruxism include loss of tooth enamel, increased tooth sensitivity, and flattening and/or chipping of the teeth. Bruxism sufferers who grind and clench their teeth while sleeping frequently wake up with a sore jaw. Treatments with Botox can provide tremendous relief from jaw soreness, headaches, and other unpleasant problems associated with Bruxism. Recently, Botox has proven to be an ideal treatment option for targeting and treating excessive muscle activity and spasticity. Many other treatments, such as anti-inflammatory medications and dental devices, do not address the source of the problem. Although dental devices can successfully protect teeth from damage at night for bruxism sufferers, they are ineffective in stopping the painful side effects of teeth grinding. By injecting small doses of Botox directly into the masseter muscle (the large muscle that moves the jaw), the muscle is weakened enough to stop involuntary grinding of the teeth and clenching of the jaw. This significantly relaxes the muscle and reduces the wear and tear on the teeth due to grinding. Damage to the TMJ (temporomandibular joint) and headaches should be reduced or eliminated as well. This procedure is relatively painless with a numbing cream applied to the skin before the small injections are administered. Voluntary movements, such as chewing and facial expressions, are not effected at all by Botox.